Many, many years ago, when we all lived in the big city of Auckland, ﻿ a group offriends all of whom had a keen interest in good food, excellent wine and having a good time, formed a group which we called The Gourmet Society. Every month each of the four couples put money into a dedicated bank account for which there was a cheque book for the ‘Gourmet Society’. For those of you young things who have no idea what a cheque book is, talk to your parents or grandparents and ask them! Suffice to say that paying our bill at the end of a night out with that cheque book raised a few eyebrows. After a while the name was shortened until we became known as the Gorms, a much more appropriate title. The group consists of Roy & I, Jacky & Chris, Anne & Greg and Colin & Edwina, most of whom we see on a reasonably regular basis. Recently, some members of the Gorms were celebrating significant birthdays so we thought it was time for a get together. 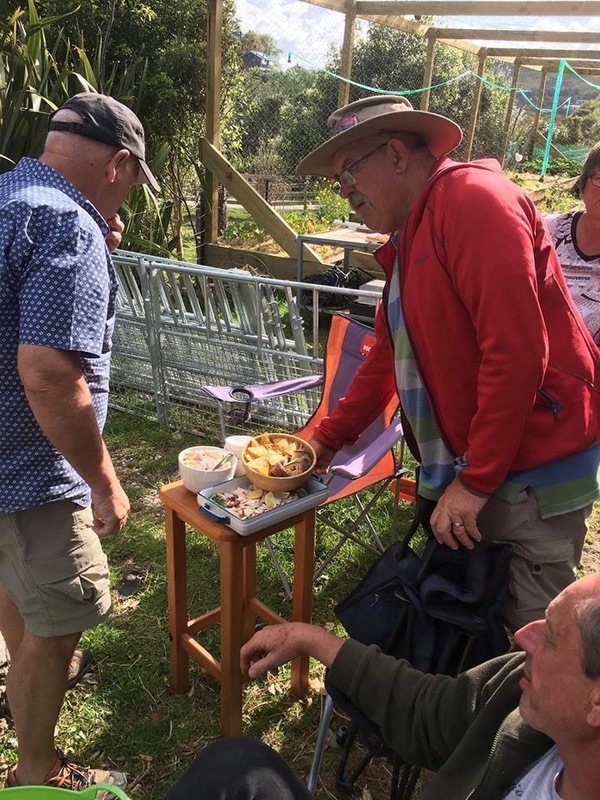 It was to be held at Jacky & Chris place at Whakapirau on the Kaipara harbour, regular readers will know that we have housesat for them over the past few winters and spent a bit of time there. 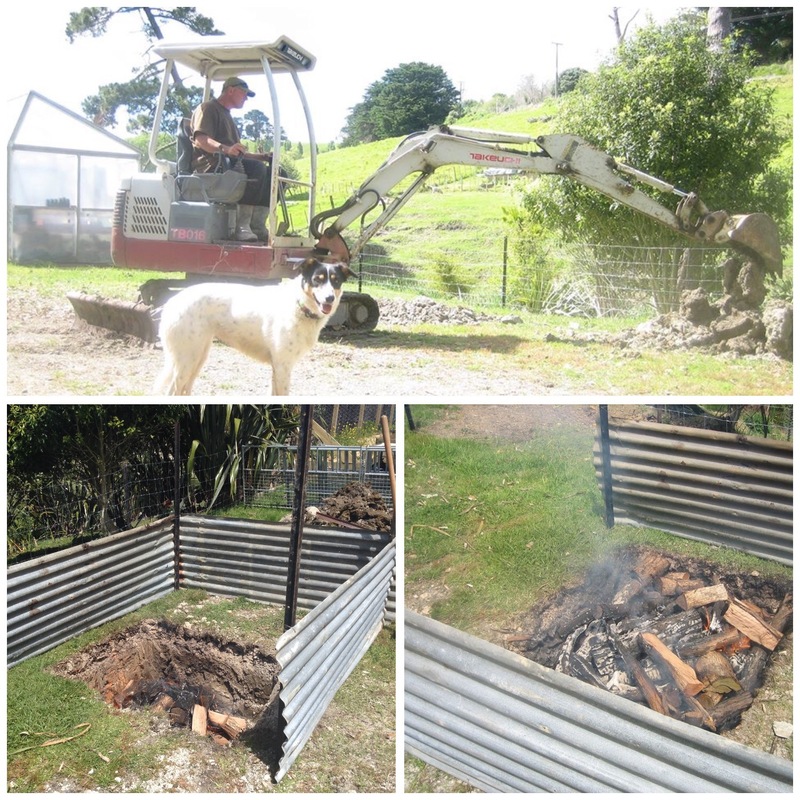 Somewhere along the line, probably over a red wine or two, it was decided that we would have a Hangi (NZ underground oven cooked meal) with local man Grant offering to set it all in place and be in charge of proceedings. First the hole had to be dug and the fire started. Grant digging the hole, the fire started in the pit, then as the fire gets hot more wood is added before adding the rocks to heat up. All this takes time and patience, and is of course thirsty and hungry work. Meanwhile, we girls lined the hangi basket with cabbage leaves, peeled lots of potatoes, kumara, pumpkin and carrots which once seasoned are tied into muslin bags and placed in the basket. Chickens and a large piece of pork are then placed over the vegetables which are then all covered with more cabbage leaves before finally topped with well soaked towels and sheets before being lowered onto the hot rocks. Then it all gets covered with topsoil to steambake for the next few hours. 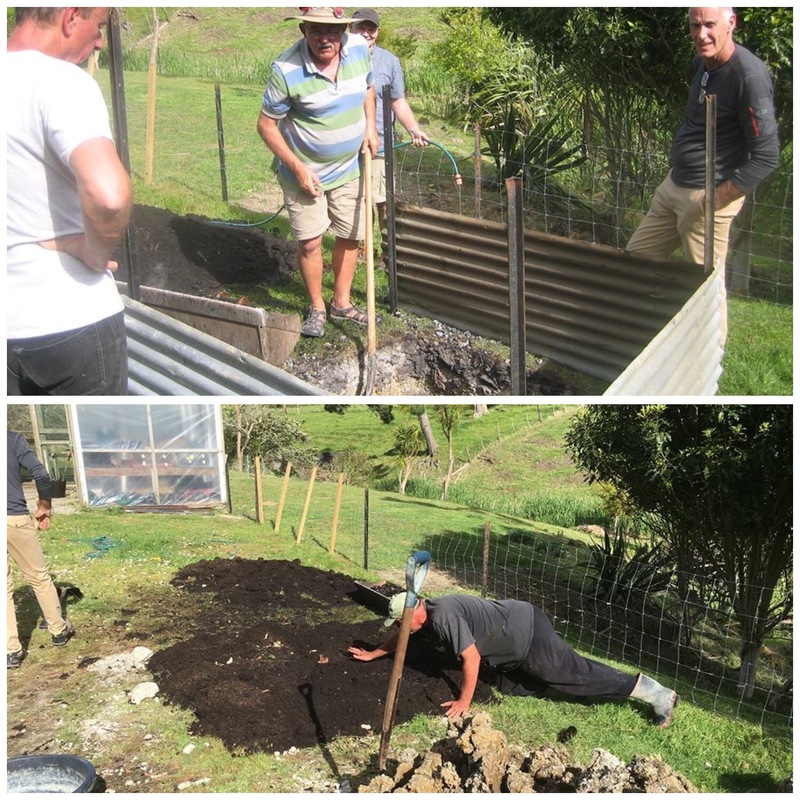 Top photo Chris, Colin and Greg look on as Roy helps remove the ash and unburned charcoal just before the food goes in.lower photo is Grant checking all is well – or is he doing pressups? There is of course a lot of skill involved with getting the fire right, using the right stones, using the best wood to provide the heat and getting everything to the correct temperature but we were assured all was in hand and under control. 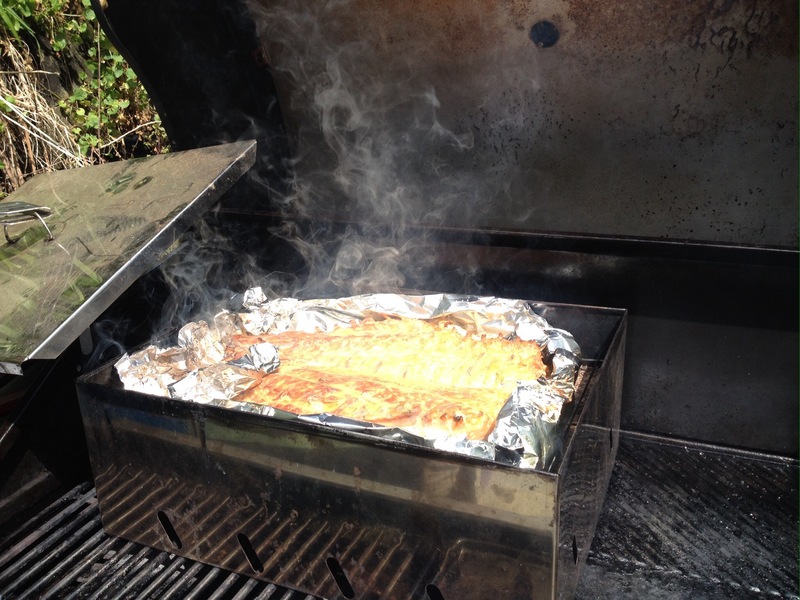 There was as well all the fish we had caught; some to be eaten as fish fillets, the big fish was being smoked and the rest was made into ceviche. A whole scotch fillet was prepared with a tasty rub and cooked on the barbecue, nicely rare of course and there were plenty of salads too. From here on in, I neglected to take any more pictures, so there is none of the hangi being lifted or any of the food ladened tables laid out for all to help themselves, nor any of the subsequent ﻿party as neighbours and others from the local community had been invited to come and share in the feasting. The hangi food was fantastic, and later in the evening the desserts came out for all to share. It was lovely to meet lots of new people and enjoy a great night together over fabulous food and wine.